When foster parents accept the challenge of caring for a child born blind and deaf, they hope to change that child’s life for the better. They don’t realize, or even expect, that the child has something vital to teach them and others with whom the child comes in contact. Shelly was just such a child. The book, released last month by Dancing With Bear Publishing, is a personal memoir of Shelly’s life as a member of the Muller family. In 2009, at age 23, Shelly’s body finally succumbed to the complications of her medical condition, Muller said. “Signing with the Angels” chronicles the two decades in which her adopted daughter grew up. In that time, Muller said, Shelly’s mere existence demonstrated what it means to live a life “fully in the moment,” taking joy in the “pure value” of her life’s experience interacting with the world. She entered the lives of Claire and Tom Muller when she was nearly 3 years old. The Muller’s are experienced foster parents. They have often made their home a haven for children and teens who are surviving and coping with life’s worst abuses. The family are glad to provide a shelter for these kids until they can be placed in stable homes with families that will, hopefully, help them build a life beyond a nightmare existence. But in addition to offering foster services for children who are physically healthy, the Mullers have also taken in foster children who are medically fragile. The children cope with a range of birth defects from Down’s Syndrome to heart problems to developmental disabilities like “Microcephaly,” Claire Muller explains in the book’s first chapter. Once in awhile, the Muller’s adopt them as a permanent part of their home, she said. Shelly was born blind at the Children’s Hospital in Columbus, Ohio, the result of a birth defect in her digestive system. “Shelly’s gut was unable to absorb the calories and nutrients. Food and drink passed through her with very little of the nutrition absorbed,” Muller said. The easiest way to explain Shelly’s blindness is that her body expended so much effort compensating for the defect while in the womb that the child was born without a developed optic nerve, Muller explained. But that was just the beginning of Shelly’s medical problems. She also developed a respiratory ailment that forced doctors into a treatment with the unfortunate side effect of stealing the child’s hearing. “The doctors had no choice. To keep her breathing, they had to use medicine that took her hearing,” Muller said. The result is that Shelly lacked the sense of sight and hearing from a very early age. The Mullers were contacted by a social worker when Shelly was just past 2 years old. The couple agreed to be Shelly’s foster parents. It was not long afterward that the Mullers adopted Shelly permanently. “I am blessed to have a husband who never questions the children we foster parent. We both simply accepted Shelly in with our other kids,” Muller said. From the beginning, it was clear that despite her physical ailments Shelly was intelligent and capable of learning, Muller said. They brought in specialists to teach Shelly sign language and an “intervener” who taught the child the skills blind and deaf people need to orient themselves to place and successfully move about. They teach cane skills and how to navigate a room without sight or hearing, she said. “One thing I learned is that there are great job opportunities for people to work with blind and deaf persons. It is a unique specialty and a rare field. There is a demand for the skills and the specialists get paid well for their services,” Muller commented. But as Shelly grew, Claire became fascinated with how her adopted daughter interacted with the world. Being blind and deaf all her life, she did not develop the ordinary fears that most children learn growing up. “She would explore in the yard, enjoying the warmth of the sun and feeling everything around her. If there was a snake nearby, Shelly wouldn’t react because she wouldn’t be aware of it. And even if she were aware, if it brushed by her, Shelly would be delighted by the sensation,” Muller said. She and Shelly made frequent flights on a small plane to Columbus to visit specialists. Shelly loved the take-off and she was delighted if there was turbulence, Muller said. “Shelly loved the sensory experience of the plane’s movement. She had no concern about what these sensations might mean. Watching her, it made me begin to look differently at the world,” Muller said. This lesson was not something Shelly only taught to her adopted mother. Her family, and others who came to know Shelly, often observed the pure joy the child took from the simple act of living in this world. It was not always that way. Shelly’s condition gave her moments of sickness and sadness, Muller said. Her doctors wrestled with the complex challenges that her birth defect presented throughout her life. Shelly pushed them professionally. Eventually, however, the problems became insurmountable, Muller said. The book, however, is not a tragedy. It is spiritual and meant to be as uplifting as Shelly was to her family and friends, Muller said. 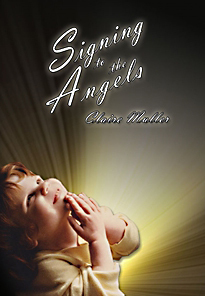 “Signing to the Angels” is a celebration of a person’s life that was far too brief, but managed to be full of a grace one often associates with angels, Muller said. “Signing to the Angels” is available direct from Dancing with Bear publishing at www.dancingwithbearpublishing.com. It can also be bought through most of the usual book selling websites such as Amazon and Barnes and Noble. All proceeds from the sale of the book will support Valley of Baca Missionary Retreat, an organization the Mullers founded to assist Christian missionaries on their visits to the United States. For more information on this service, visit www.valleyofbaca.org.